If you have ever been to Warsaw - the city where Panufnik was born and lived for many years - and which I visited three years ago, one thing will come up and strike you hard. To appreciate this you must visit the Warsaw History Museum in the Old Town Market Square. There you will see hundreds of photos of the city taken during the war and soon after. The scenes are of complete devastation. The city was flattened so that almost nothing remained. It is especially difficult to realize this as so much has now been rebuilt painstakingly and lovingly just as it had been. The work continues. It is this sense of rebuilding the past, cherishing it and respecting it that inhabits the music presented here. It was almost as if in the late 1940s and 1950s Poland was searching for its identity. Under Stalin and his successors the task was almost impossible. This music represents in microcosm this rebuilding process. Panufnik stands as one of its prime architects. He was Poland’s leading composer and conductor throughout the 1960s and 1970s. Although Lutosławski was highly regarded he is more of an international figure. 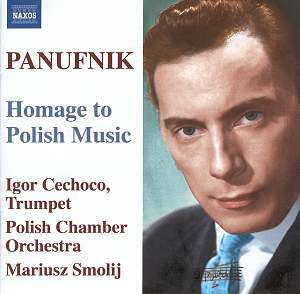 Panufnik, although moving to England in 1954, always seems to have retained much that was Polish as this CD testifies. One of the best composer autobiographies ever is ‘Composing Myself’ (Methuen, London, 1987). It is Panufnik’s life story told with colour and with aching truthfulness. In it he tearfully points out how all of his very early music - that written up to his thirties - was destroyed when Warsaw was destroyed. He recounts how he had to start his professional life from scratch after the war. Later he was to come to England for good. I met him once at his comfortable home by the Thames in Twickenham. I was taken by a priest friend and remember little except that the composer talked of the evil of the regime and “how” (I wrote in my diary) Rustica - that is the Sinfonia Rustica of 1948 - was decried, no longer to exist and how some composers cracked under the suppression. When you hear the ‘Hommage to Chopin’ on this disc you are very near both in time and sound to the ‘Sinfonia Rustica’. Panufnik makes no attempt to write a piece in the style of Chopin or to use any Chopin melodies. He simply writes in his own style. It must also be remembered that the war also annihilated the original ‘Chopin Salle’ now thoughtfully and beautifully reconstructed. Similarly razed to the ground was the Chopin Museum which, incidentally, containsthe wonderful cast of Chopin’s hand. All of this is right on Panufnik’s doorstep and very much a part of his inheritance. So how should we hear this music? Perhaps a good starting point is to consider Warlock’s Capriol Suite for strings which uses Renaissance melodies. The opening work here is the five movement Old Polish Suite, also for strings, which uses traditional dances and ancient melodies. It comes out the same duration as the Warlock. You might also consider Respighi’s Ancient airs and dances whilst listening to the Concerto in Modo Antico. This is scored for trumpet, timpani, two harps, harpsichord and strings and falls into several sections using melodies from the fourteenth to the seventeenth centuries. Rather curiously and annoyingly it is allotted only one track. Nevertheless the tunes are quite contrasted and well chosen by the composer to be memorable. Finally the Jagiellonian Triptych is a short work of just three movements. It is a stylistic pastiche. The title refers to an imaginary altar piece. The whole work was written in England, steeped in nostalgia and is imaginary of a past Poland. This was quite appropriate as it was commissioned to be performed in London at a concert to celebrate the Millennium of Polish Christianity. The rather homophonic middle movement sounds something like a solemn hymn. This is an altogether curious disc. The music is by a composer of considerable stature demonstrating a side facet of his work that has, up until now, been almost entirely unknown. Performances both by the orchestra and the soloists are excellent, stylistically aware and tempi seem to be most suitable. The recording is vivid and brings the music to life.